Pinkeye isn’t child’s play. In addition to being highly contagious, uncomfortable and an eye sore, a case of pinkeye could cause serious damage if left untreated. When an eye is inflamed, as it is when you’ve contracted a bacterial or viral pinkeye, the blood vessels in the conjunctiva dilate, causing this white part of your eye to turn pink. Oh pinkeye, you always choose the best times to visit. Your attractive symptoms (crusty, pink, itchy, and watery eyes) are so easy to disguise—if eye patches were in fashion, that is! Since they’re not, it’s time to learn what pinkeye is, what causes it and how to treat it, or—better yet—how to prevent it. Pinkeye, also known as conjunctivitis, is inflammation of the conjunctiva (a thin membrane that covers the inner part of the eyelid and the white part of the eyeball, or sclera). It’s caused most commonly by a bacterial or viral infection. Change your towel and washcloth daily and don’t share them with others. Allergic conjunctivitis More common among those with seasonal allergies. It develops when a person comes into contact with an allergen that causes a reaction in the eye. Chemical conjunctivitis Can be caused by airborne irritants (e.g., pollen or smoke), chlorine in a pool, cosmetic ingredients, or other products that come in contact with the eye (e.g., contact lens solution). Bacterial conjunctivitis Most often caused by staphylococcal or streptococcal bacteria from the skin or respiratory system. It can also be caused by insects, contact with other infected people, poor hygiene (e.g., touching your eyes with dirty hands), or using contaminated makeup or facial lotions. Viral conjunctivitis Most commonly caused by contagious viruses associated with the common cold. It can also develop through exposure to someone with an upper respiratory tract infection. Viral conjunctivitis can occur as the virus spreads along the body’s mucous membranes, which connect the lungs, throat, nose, tear ducts, and conjunctiva. Because the tears drain into the nasal passageway, forceful nose-blowing can cause a virus to move from the respiratory system to the eyes. Viruses are the most common culprits of infection. These annoying microorganisms find their way into the conjunctiva and infect it, causing aggravating symptoms like crusty discharge and redness. Less common but also to blame for many cases of pinkeye are bacterial infections. According to the Merck Manual on infectious conjunctivitis, those who suffer from an upper respiratory infection are more likely to contract a viral case of pinkeye. Absolutely! “[Viral and bacterial] conjunctivitis are very contagious and often spread through schools and other crowded places,” says Dr. Laurie Barber, clinical spokesperson for the American Academy of Ophthalmology. Direct contact with another person’s bodily fluids (usually through hand-to-eye contact) is a common way to catch the infection. You can also become infected by bacteria that lives in your own nose and sinuses, or by using unclean or poorly fitting contact lenses. Allergic and chemical conjunctivitis, however, are not contagious. The key to avoiding infection is good hygiene. Use hand sanitizer when you’re out and wash your hands regularly. If someone in the house is infected, use separate towels, washcloths and bed linens. It’s also best to stay home from work or school for several days to avoid the risk of spreading the infection. Why Does Your Eye Turn Pink? When an eye is inflamed, as it is when you’ve contracted a bacterial or viral conjunctivitis, the blood vessels in the conjunctiva dilate, causing this white part of your eye to turn pink. “Since the lining of the eye is usually clear, an irritation or infection causes the vessels to engorge, becoming more visible to the naked eye…The conjunctiva may become red if the blood vessels hemorrhage or bleed,” explains Dr. Pierce. Ever woken up with your eye stuck shut by a goopy, crusty film? That’s the discharge caused by pinkeye. “Beyond the pink discoloration to the whites of the eyes, people with pinkeye may also experience symptoms that include a gritty feeling in one or both eyes, itching or burning sensation in one or both eyes, excessive tearing, discharge from one or both eyes, swollen eyelids and/or increased sensitivity to light,” Dr. Pierce says. 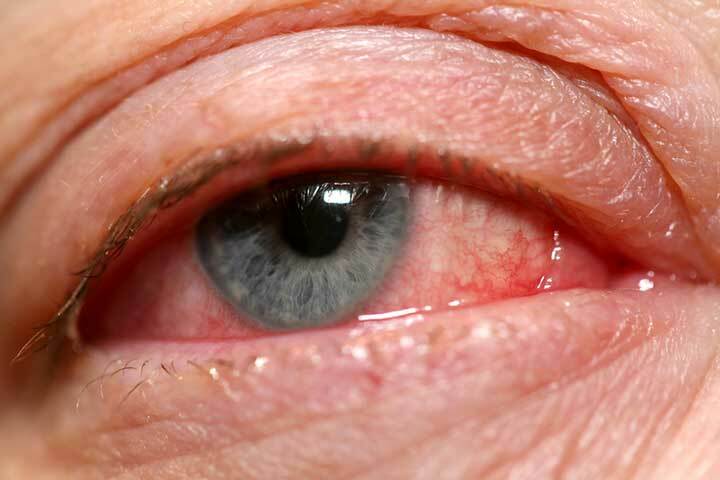 Allergic conjunctivitis causes itchy, red, sometimes burning and watery eyes with puffy eyelids. 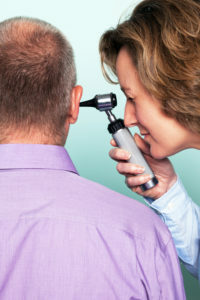 This happens as a direct result of contact with an allergen such as pollen, pet dander or smoke. What Are the Dangers Caused by Pinkeye? Severe infections can result in scarring of the conjunctiva, which can lead to long-term vision difficulties. Luckily, this is rare. Other infections can spread to the cornea (the clear layer that covers the iris and pupil). In the case of a newborn, pinkeye could lead to blindness if left untreated. The best treatment will depend on the cause and severity of the conjunctivitis, says Dr. Pierce. Severe cases of pinkeye may call for the use of topical steroid drops. “[These] may be prescribed to reduce the discomfort from inflammation. However, these drops will not shorten the infection,” he explains. See the chart below to determine the best course of treatment for each type of pinkeye. Bacterial conjunctivitis Antibiotic ointments and eyedrops are useful only when dealing with a bacterial case of conjunctivitis, so it’s important to get diagnosed before choosing a treatment. Allergic conjunctivitis Those who suffer from allergic conjunctivitis may “be told to use certain eye drops to help with the itchiness and puffiness,” says Dr. Barber. Chemical conjunctivitis Those who suffer from chemical conjunctivitis should carefully flush their eyes with saline and/or topical steroids, recommends Dr. Pierce. To relieve symptoms from all types of pinkeye, Dr. Pierce suggests applying a cool compress to the affected eye. Don’t use the same compress for the other eye and wash your hands after you’ve touched it. Throw the cloth in the laundry to make sure you don’t spread the infection. How Long Does Pinkeye Last? “Conjunctivitis usually goes away on its own within one to two weeks,” says Dr. Barber. However, severe forms of inclusion conjunctivitis could last for months, if not properly treated. aging, Aging eyes, allergen, allergies, allergy, allergy season, antibiotics, are bleach fumes dangerous, bacteria, bleach fumes, common cold, contact lenses, dangers, eye care, eye drops, eye health, eye infections, eye surgery, eye test, eyesight, health, infection, inflammation, lasik eye surgery, light sensitivity, sclera, seasonal allergies, skin, viral infection, virus.